Christ Plays in Ten Thousand Places reunites spirituality and theology in a cultural context where these two vital facets of Christian faith have been rent asunder. Lamenting the vacuous, often pagan nature of contemporary American spirituality, Eugene Peterson here firmly grounds spirituality once more in Trinitarian theology and offers a clear, practical statement of what it means to actually live out the Christian life. Writing in the conversational style that he is well known for, Peterson boldly sweeps out the misunderstandings that clutter conversations on spiritual theology and refurnishes the subject only with what is essential. As Peterson shows, spiritual theology, in order to be at once biblical and meaningful, must remain sensitive to ordinary life, present the Christian gospel, follow the narrative of Scripture, and be rooted in the “fear of the Lord” — in short, spiritual theology must be about God and not about us. 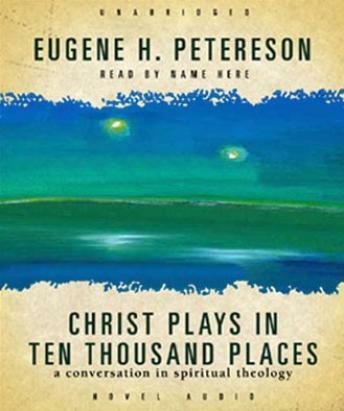 The foundational book in a five-volume series on spiritual theology emerging from Peterson’s pen, Christ Plays in Ten Thousand Places provides the conceptual and directional help we all need to live the Christian gospel well and maturely in the conditions that prevail in the church and world today. wonderful book. packed with exegetical spiritual theology and yet still straightforward and very readable (or listenable). Excellent Book, it covers a vast array of material, but does so in a way that is not confusing. I would greatly recommend this book.